Premium jigsaw puzzle - made out of wood! At PuzzlesPrint, you can make your own wooden jigsaw puzzle! You can personalise it with your favourite photo and add a text message to it. Personalised wooden jigsaw puzzles are great as gifts for occasions like Christmas, weddings, birthdays or Valentine’s Day! Simply pick a photo from any occasion – your family vacation, your last birthday party, family photos, pet photos, graduation photos, wedding photos, funny photos or even selfies! To start creating your wooden photo jigsaw puzzle select jigsaw size and upload a photo, design or artwork! Wooden jigsaw puzzle - outstanding photo gift! Personalised wooden jigsaw puzzles are a relatively new concept compared to standard cardboard jigsaw puzzles. The pieces of wooden puzzles are much stronger, and the wood gives a nice feel when you hold the jigsaw pieces as compared to standard cardboard puzzles. We have two different wooden photo jigsaw sizes and six different piece counts. You will find different complicity difficulty wooden puzzles. We have one to fit your needs! Wooden puzzle pieces as message! Compared to other wooden photo jigsaw manufacturers, PuzzlesPrint offers three special wooden jigsaw puzzles. For each puzzle, you can have a message cut out. Each letter is a puzzle piece, and the larger letter pieces are surrounded by regularly shaped photo jigsaw pieces! Messages include: “I love you”, “Merry Christmas” and “Happy Birthday”. By ordering our wooden jigsaw puzzles with message pieces, you can create a unique photo gift that will be memorable and appreciated! High quality photo jigsaw - beautifully presented! Our wooden jigsaw puzzles are made out of 4mm (0.18”) plywood. Each wooden jigsaw puzzle that we make is beautifully packaged in a custom-made box that has your selected photo on the lid. It is very easy to order a personalised wooden jigsaw puzzle. 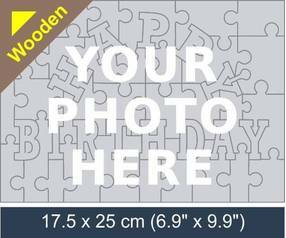 Simply select the puzzle size and piece amount, upload your photo, adjust the photo or add a text message, select your desired quantity and add it to your shopping cart.